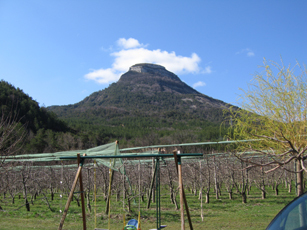 We climbed this fine looking peak while on a rock climbing trip to Orpierre in the Southern France area (near Gap). Catherine isn't all that much into rockclimbing, so I spent the days mainly with George, Marie and Jean-Philippe. However, on the last day before our departure we quit climbing at 4pm and headed down to the cabin to pick up Catherine. In the end it was just us and the two Bolands who went on the hike, which starts near the Orpierre campground. The trail is clearly marked with yellow marks and I was leading up the first half of fairly steep terrain. Eventually George took over, followed by Marie, who even though she was carrying a backpack could have been faster than all of us, I am sure. After little more than 50 minutes we arrived at the summit and enjoyed the beautiful views of the climbing rocks and the old village center of Orpierre as well as the higher, snow-covered Alps further to the East. After about 20 minutes on top and lots of picture taking, we headed down but instead of descending the steep trail we had come up we ended up going the backside of the mountain where another trail gradually descends a forest road down to an intersection with the GR946, which then leads back to Orpierre. Even though it took a bit longer, we still managed to complete the circle in less than 2.5 hours and made it back for dinner just in time. All in all a great quick outing and nice ending of a cool climbing trip.